So many of you ask me what you should see when you’re in the city, that I thought it probably was time, just before the summer vacation rush starts, to let you know! I know you’re looking for quality programs that are appropriate for you and your family. Knowing that a show has won awards or has a Hollywood star in it might not be enough information for you to decide whether that’s the one you want to see, and with ticket prices what they are, you don’t want to leave it to chance. For the shows mentioned in this article, I’ve included the content issues to help you make an informed decision. Not every show is right for every person. For a full review of the show, click on the show’s underlined title (note: some of these longer-running shows opened before we started reviewing, so there isn’t additional information for those). 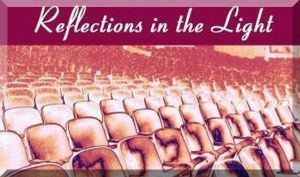 Thanks to all of you who subscribe to our reviews here at http:reflectionsinthelight.blogspot.com, the only source for a review with added information from a Christian perspective. You can see reviews for Broadway and Off-Broadway shows as well as a list of all shows playing on Broadway and a schedule for touring shows by scrolling down at left or below, so take a look at all the site has to offer and tell your friends about it! Discounted tickets to friends of Masterwork Productions for many of the shows are available at http://www.givenik.com/index.php/Masterworks. There are some great newer shows that I highly recommend. 1. Memphis at the Sam S. Shubert Theatre, 225 West 44th St. I really loved this musical (winner of the 2010 Tony award for Best Musical) and the performances of its two stars, Montego Glover and Chad Kimball. It’s the story of an interracial romance in 1950s Memphis at the start of rock & roll. 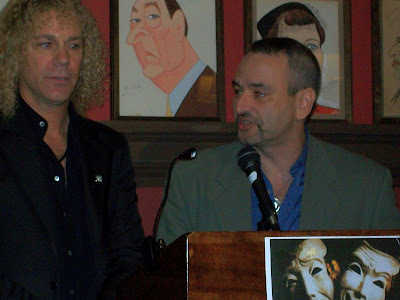 The catchy score is by Bon Jovi’s David Bryan. The story (book by Joe DiPietro) is full of heart, humor and heat (both the score and the book won Tonys too). 2. Million Dollar Quartet at the Nederlander Theatre, 208 West 41st St. This jam session is more like a revue than a typical Broadway musical and features the music of Elvis Presley, Jerry Lee Lewis, Johnny Cash and Carl Perkins in the recreation of a real-life recording session with the four legends. Highlighting the show is Levi Kreis (2010 Tony award for featured actor in a musical) as Lewis who does some amazing gymnastics on the piano. 3. 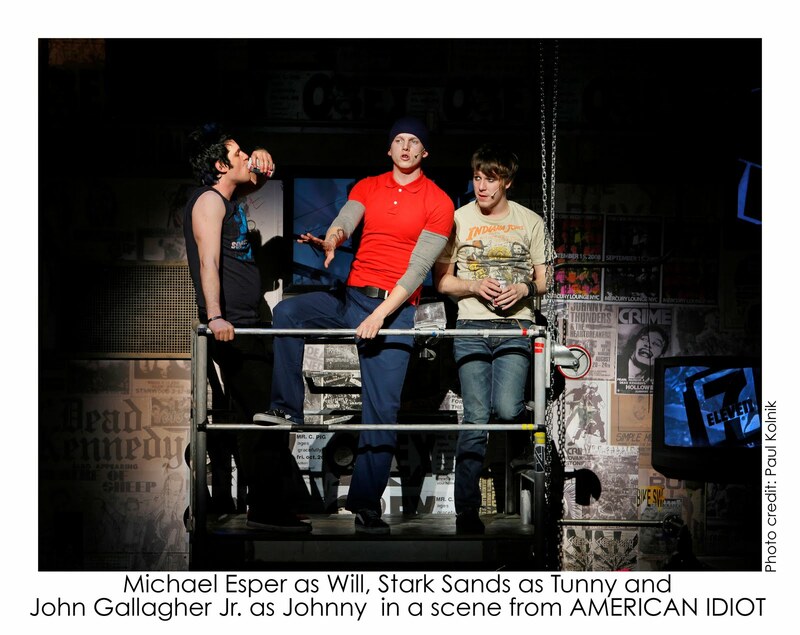 American Idiot at the St. James Theatre, 246 West 44th St.
It’s Green Day’s multi-platinum album come to life. It’s cutting edge, full of punk music, great dancing, and all manner of objectionable stuff – and it’s really good. Emerging from a “Boulevard of Broken Dreams” is a terrific redeeming message. If “Jesus of Suburbia” is someone your kids know or can relate to, this show might be a great conversation starter. 4. Next to Normal at the Booth Theatre, 222 West 45th St.
A musical about mental illness? The idea didn’t excite me, but all that changed with the first chord of Tom Kitt’s electrifying score (which won the 2009 Tony). He and lyricist Brian Yorkey won the 2010 Pulitzer Prize for this stand-out musical about a family coping with the mother’s bi-polar depression. It really makes you think and feel while entertaining you. 5. 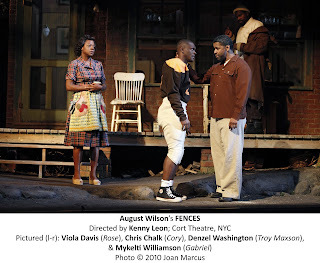 Fences at the Cort Theatre, 138 West 48th St. This Pulitzer-Prize-winning segment of August Wilson’s 10-play cycle about the lives of African Americans in Pittsburgh is a winner (literally -- it won the 2010 Tony for best revival of a play and best acting trophies for its stars Denzel Washington and Viola Davis). Tickets are hard to find for this sold-out show which end its run July 11, but if you can get them, go! Wicked at the Gershwin Theatre, 222 West 51st St.
•There is magic- the girls meet at a magic school, there is chanting of spells and the use of magic to transform people into other things. •There's some intimacy between two characters outside of marriage-- you know it happens, but it's not played out in any detail. Phantom of the Opera at the Majestic Theatre, 247 West 44th St.
Andrew Llyod-Weber’s beautiful score tells the tale of a young ingénue and her mysterious music teacher who lives in the labyrinth below the Paris Opera House. The special effects, sets, costumes and beautiful songs like “All I Ask of You,” “Wishing You Were Somehow Here Again” and “The Music of the Night” still delight even after 20 years on Broadway. A sequel to the story is set for Broadway next season. Catch the revival on Broadway (or the upcoming tour) directed by Arthur Laurents, who wrote the original book. The choreography is terrific, as is the score by Leonard Bernstein with lyrics by Stephen Sondheim. Jersey Boys at the August Wilson Theatre, 245 West 52nd St. This is the story of Frankie Valli and the Four Seasons featuring many of their most popular tunes. This Tony-Award-winning musical has been packing them in on Broadway, as well as tours across the country on tour. It’s better than the average “jukebox musical” because of the really good book written by Marshall Brickman and Rick Elice, direction by Des McAnuff and choreography by Sergio Trujillo. The story of striking coal miners and the son of one who struggles to fit in while pursuing his love of ballet taken from the movie of the same name. The dancing in this 2009 Tony award Winner is terrific, but the story contains some elements that would make me hesitate about taking kids younger than high school age (and maybe not under 16) even though it doesn't post a Mature Advisory. • An added personal note: I was distressed by 10 and 11 year olds (and younger) using explicit sexual terms, foul language and cross dressing. Don’t forget that some of the best theater New York has to offer takes place Off-Broadway (and the tickets are a lot cheaper). If you have to pick just one show to see, make this it one. Never have I been so transported (thanks to the masterful direction by David Cromer) by a theatrical experience. 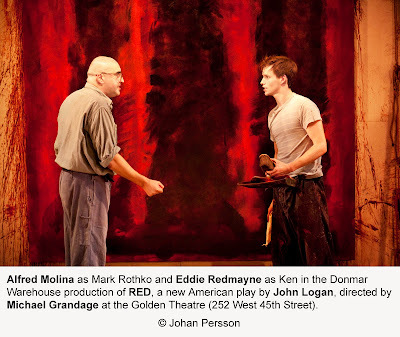 I’m not in love with this classic three-act by Thornton Wilder – maybe because it’s produced so often and so badly – so I waited a while before venturing down to the Village to see it. I was blown away. This is the production by which all others should be measured. Unbelievably moving and satisfying with a terrific message about not taking any minute of your life for granted. Jim Brochu’s stunning portrayal of actor Zero Mostel. I'm not a fan of most one-man shows, but this one is different. A fabulous performance and fascinating information about the life of the actor who brought Fiddler on the Roof to Life. A recreation of the classic 1935 Alfred Hitchcock movie by the same name. While the film was all espionage thriller, this show is mostly parody and slapstick comedy. All of the famous elements of the film, including the chase on top of a speeding train are in there, as well as references to Hitchcock’s other famous movies and a trademark cameo appearance by the director. I saw this show on Broadway before its transfer Off-Broadway and before I was reviewing, so I don’t have notes about specific content issues, but I don’t remember any. I just remember thinking it was one of the most delightful things I’d seen on stage in a long time. 4. The Screwtape Letters at the Westside Theatre (Upstairs), 407 West 43rd St.
Max McLean stars as Screwtape, a demon who gives instructions in spiritual warfare to his nephew, Wormwood, through a series of letters he dictates to a helper demon, Toadpipe. This adaptation (by McLean and director Jeffrey Fiske) captures the heart and wit of author C.S. Lewis in an entertaining, yet thought-provoking performance. 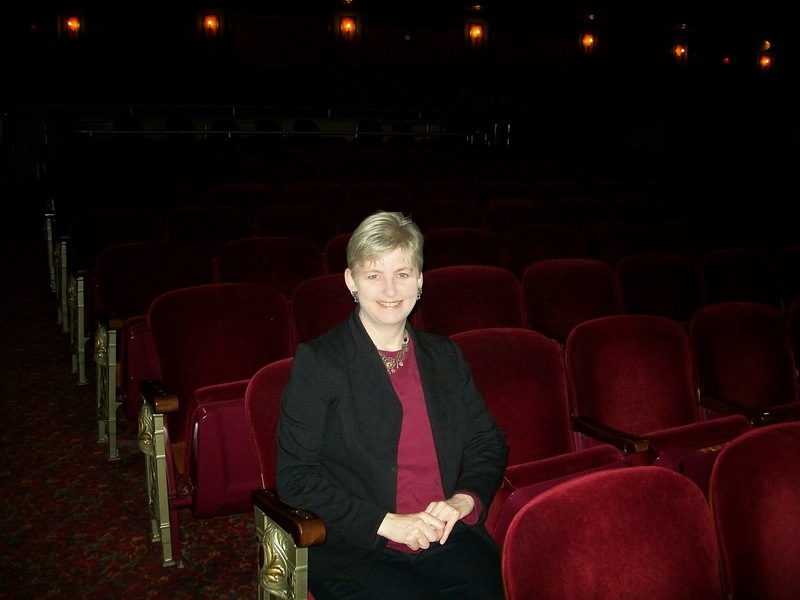 McLean is a recipient of the 2010 Masterwork productions, Inc. “The Lights Are Bright on Broadway” award given to individuals and organizations making a difference in the Broadway community through their faith for this performance. This revival, directed by Tom Jones, who wrote the original book and lyrics (score is by Harvey Schmidt), is another “how-it-should-be-done” production. Its simplicity is endearing, as are the classic tunes “Try to Remember” and “Soon It’s Gonna Rain” and “They Were You,” among others accompanied only on piano and harp. A sweet tale of a girl and a boy in love. • God’s name taken in vain. in the heart of New York's Little Italy. 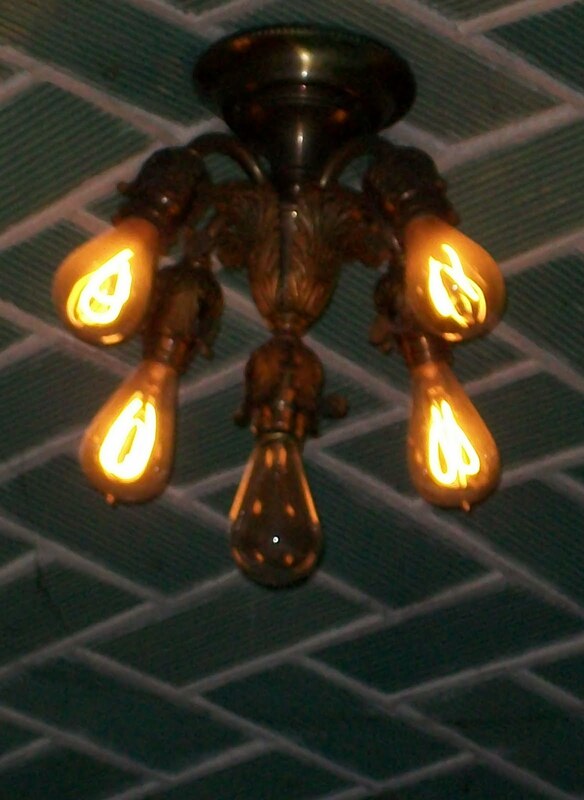 Wish you grew up in Little Italy? You might just feel like you did after taking one of the new “local tours given by locals” hosted by Raffaele (Ralph) Tramontana, Ernest Magliato and Bill Bray. All are born and bred in the vibrant community known as Little Italy, a neighborhood located in lower Manhattan roughly between Bayard , Bleecker, Lafayette and the Bowery, once home to many Italian immigrants coming to New York City in search of a new life. The tour guides welcome you like a long-lost relative visiting from the old country and point out places of interest (as well as their own childhood haunts) along the three-hour walking tour. I attended a press preview and recommend it to all of you readers who contact me about shows and other interesting things to do while you are in the city. Ernest does most of the talking in conversational form, rather than memorizing a long, pat tour-guide shpeel. Ralph and Bill were sort of the “color commentators” adding information and personal stories about growing up in the neighborhood. “Hi, Ralph,” called one woman from across the street as the tour walked by. This greeting of neighborhood friends continued throughout. 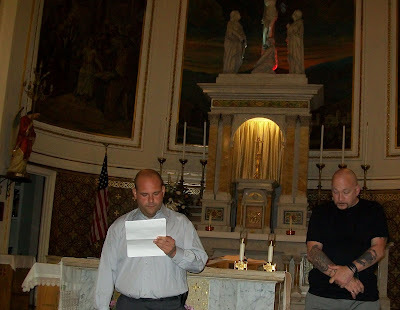 Ernest and Bill getting ready to start the tour at Most Precious Blood Church. Beginning at Sambuca’s Café, which Ralph owns, the tour stopped next door at The Most Precious Blood Church, home of the national Shrine of San Gennaro, patron saint of Naples. (Ernest is a vendor at the saint’s annual feast, one of the largest street fairs in the country). 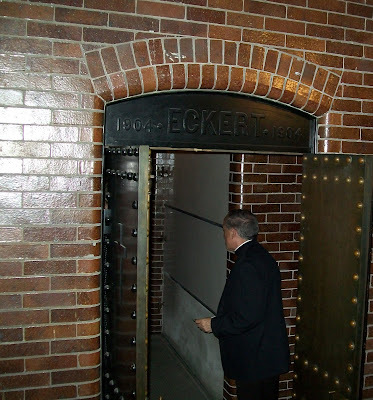 The tour heads down famous Mulberry Street to the Italian American Museum housed in the former Banca Stabile, which was the cultural center of Little Italy between 1890 and 1920. There immigrants could purchase steamship tickets, send telegrams back to the old country and exchange currency. The museum’s president Dr. Joseph V. Scelsa showed a short video about the museum and the area’s history (including a time during WWII when Italians were classified as “enemy aliens”) and noted interesting exhibits including a display honoring Luigi DelBianco, chief carver of Mount Rushmore, a sculpture titled “Resurrection” by Arturo DiModicau and memorabilia donated by Frank Serpico, the New York City cop famous for exposing corruption in the force in the early 1970s. Next came a stop at DiPalo’s, one of New York’s premiere cheese and Italian gourmet shops, complete with samples of meat, cheese and wine enjoyed in the hanging-cheese trimmed store. Fourth-generation Tony DiPalo spoke about how some of the foods are made and Ralph shared a story about how his nephew put himself through college working for Tony. 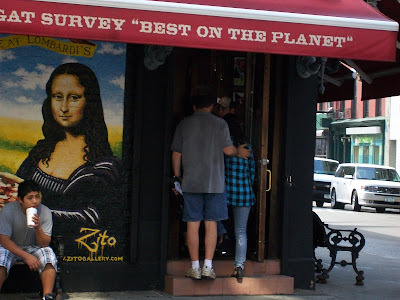 The first American pizzeria, Lombardi's, above, and the oldest Italian bakery in Little Italy are points of interest along the way, as are other neighborhood buildings, like a school. 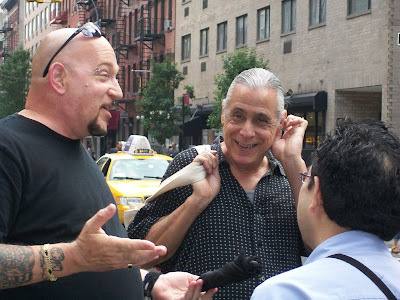 Bill and Ralph at Prince and Mulberry. Before it was a school, Ralph, chimes in, it was an empty lot where the neighborhood kids played baseball. Also nearby is the corner of Prince and Mulberry streets, where “stickball” was born. And over there is where director Martin Scorsese , also a product of Little Italy, filmed the scene in one of his movies. Over there is a location from the TV series The Sopranos… and so it continues. 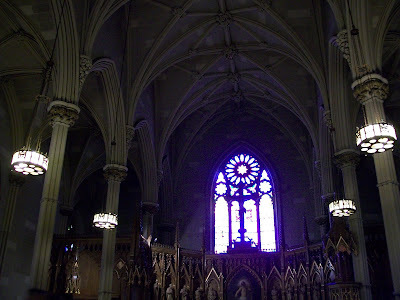 On to the original St. Patrick’s Cathedral, above, (before the newer namesake was constructed on Fifth Avenue and 50th Street), now designated a basilica. Msgr. Donald Sakano met us for a tour of the church, which boasts a duplicate of the ceiling in the Fifth avenue cathedral and a massive organ. The church also is the home of New York’s only underground catacombs, now closed to the public. Renovations are underway to construct a stairway and glass panels in the church court yard allowing a peek into the tunnels and the guides hope to include them on the tour in the future. If they do, I can report that it will be an interesting experience because Msgr. Sakano found the key and took our press group on visit as a special treat. 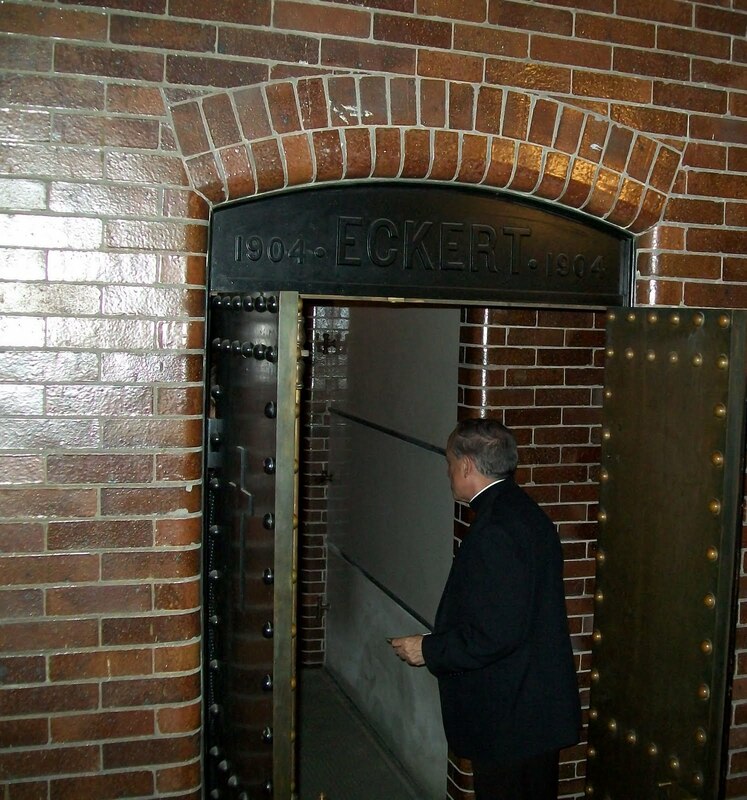 Most of the tombs are sealed, but the crypt where Gen. Christopher Carleton Rice, above, was interred in 1848, is open and still boasts its original Edison light bulbs (below right). The tour concludes with a meal at Grotta Azzurra Ristorante, a Little Italy landmark since 1908 and a frequent gathering place for the Rat Pack (the food is included in the tour price of $59.95). The three hours sped by, and rain showers didn’t dampen the enthusiasm of the guides or those enjoying the tour. 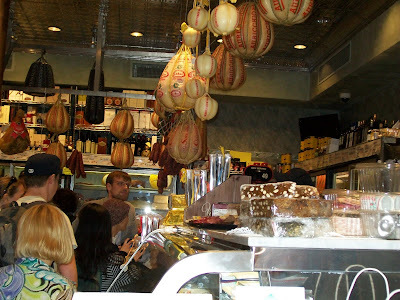 For more information or to book a tour, visit http://www.nyclittleitalytours.com/, call 646=720-9410, or email info@nyclittleitalytours.com. Tickets also are available at E. Rossi & Co., 193 Grand St., at the Italian American Museum, 155 Mulberry St. or at Sambuca’s Café, 105 Mulberry St.
Tours leave seven days a week from Sambuca’s at 11 am and 3 pm sharp. I enjoyed an informative Drama Desk panel discussion on "The Music is the Message: Musicals on Topical Subjects" Friday at Sardi's. The panel was moderated by Scott Siegel, Drama Desk member and critic for TalkinBroadway.com and TheaterMania.com, as well as the creator/writer/host of the acclaimed Broadway by the Year series at The Town Hall. 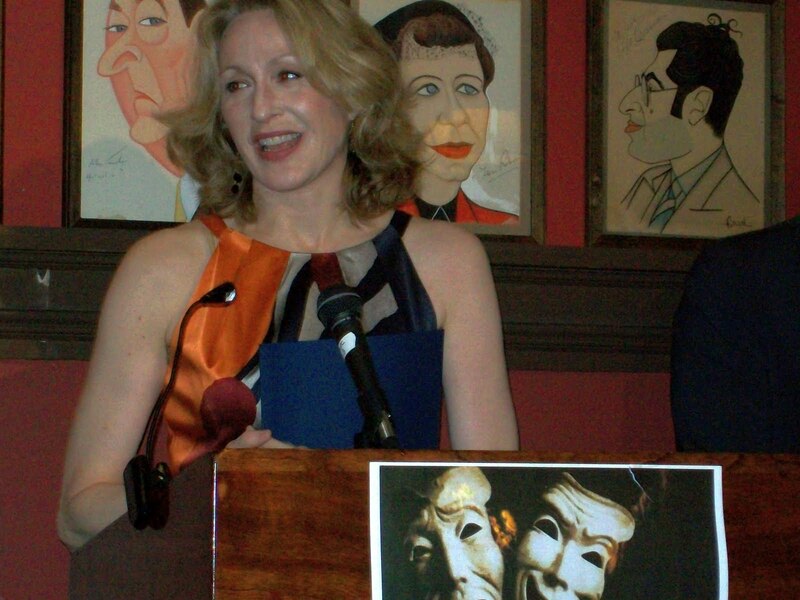 Participating panelists (pictured above) were(in alphabetical order): Christine Andreas, featured in the Drama Desk Award winning revival of La Cage aux Folles; Drama Desk nominee Jeffry Denman, the choreographer of Yank!, who also played Artie in the production; Montego Glover, whose performance as Felicia in Memphis won the 2010 Drama Desk Award for Outstanding Leading Actress in a Musical (an award she shared with Catherine Zeta Jones); Chad Kimball, the Drama Desk Award and Tony Award nominee for his portrayal of Huey in Memphis; Tom Kitt, Tony Award and Pulitzer Prize winning composer of Next To Normal; David Thompson, book writer of The Scottsboro Boys musical; and David Zellnik, the Drama Desk nominated author and lyricist of Yank! 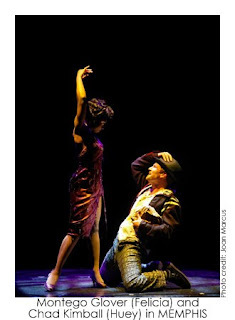 Playwright Kia Corthron and actor Max McLean have been named recipients of 2010 “The Lights are Bright on Broadway” awards presented annually by Masterwork Productions, Inc. to individuals and organizations making a difference in the Broadway community through faith. Corthron (Breath, Boom; Force Continuum), is being honored for her play A Cool Dip in the Barren Saharan Crick, which ran last spring at Playwrights Horizons (presented as a co-production with The Play Company and Culture Project) for its positive representation of an African preacher-in-training as he interacts with his host family and a troubled orphan in a drought-stricken rural American community where he studies religion and water conservation. "There is widespread intolerance - a sense of threat - in fundamentalist Christianity regarding people exercising individual freedoms, just as there is widespread intolerance - a sense of threat - in left-progressive and artistic circles regarding Christianity in any form. I have people close to me who are members of both flanks (as well as many in between), and while it was not my conscious intention, I would be truly gratified to know that A Cool Dip may have fostered some new understanding and compassion,” she said. 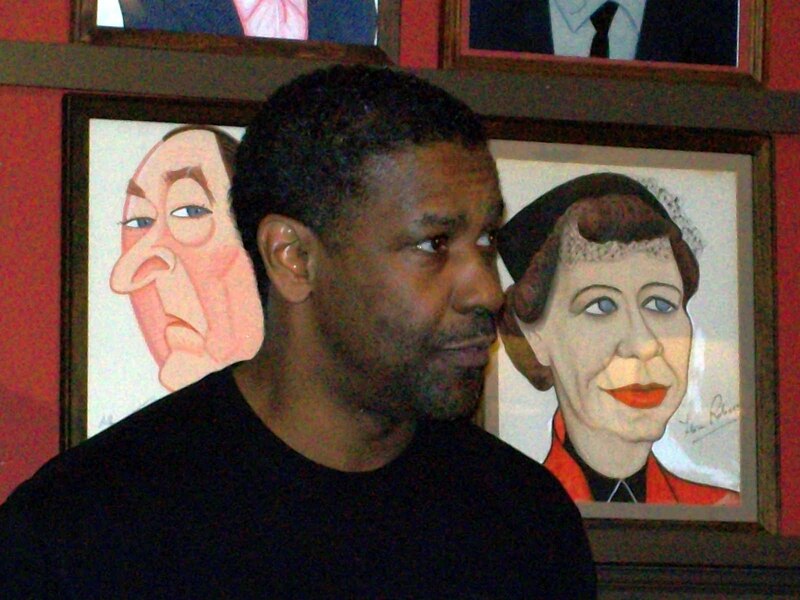 McLean is being honored for his portrayal of C.S. Lewis’ famous demon extraordinaire Screwtape, who coaches his nephew demon in training about the art of spiritual warfare. 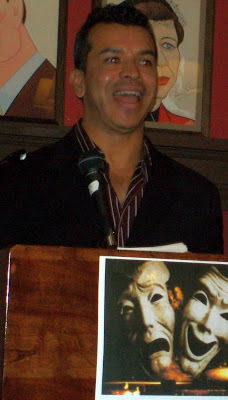 McLean co-wrote the adaptation of The Screwtape Letters with director Jeffrey Fiske. 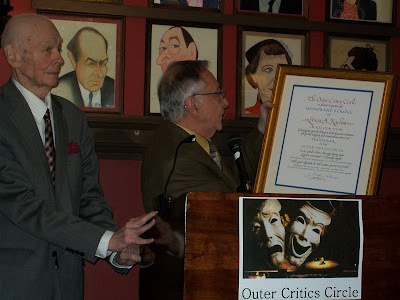 McLean’s award will be presented following the Monday, June 28 performance of the show which is running Off-Broadway at the Westside Theatre. 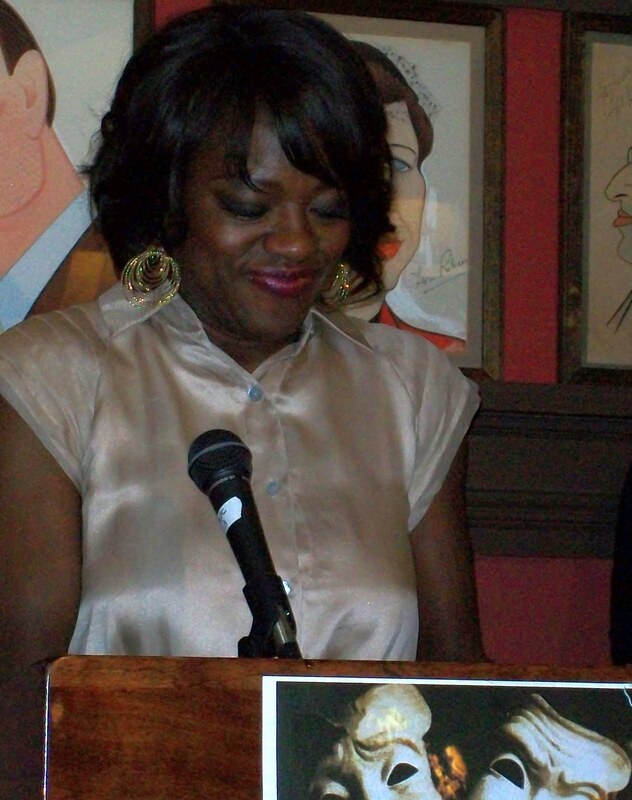 Corthron will receive her award June 30 at Playwrights Horizons. 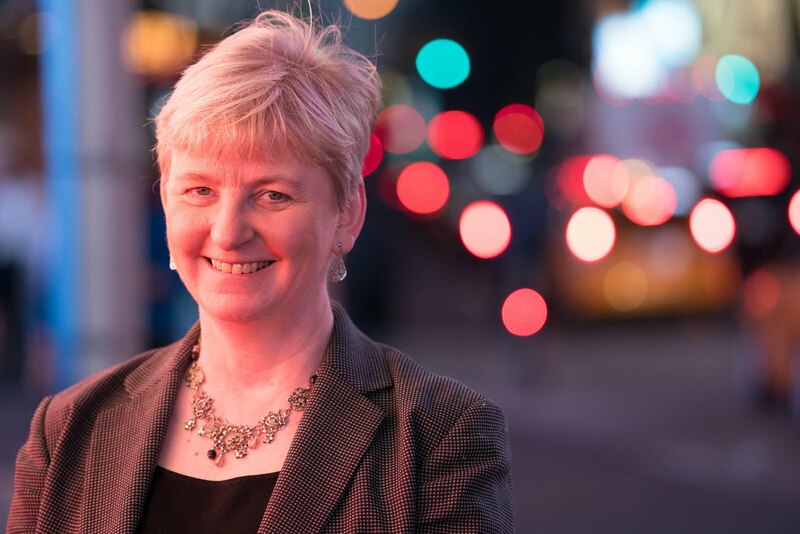 Last year's recipients were playwright Dan Gordon for Irena's Vow on Broadway, and Radio City Rockette Cheryl Cutlip, founder of Project Dance. Masterwork Productions, Inc. is a faith based, non-profit organization which helps Christians and churches reach out through the performing arts by producing shows and events, booking artists, providing Broadway and theater reviews (http://reflectionsinthelight.blogspot.com) and training at workshops and conferences. 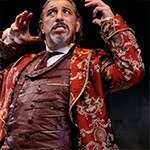 For more information, visit http://www.masterworkproductions.org/. An effervescent leading lady, a couple of good comedic turns and attention to detail from director Brian Gillespie, not to mention a revival of Pulitzer Prize winning playwright David Lindsay-Abaire’s delightful play Wonder of the World, combine to make an entertaining night at the theater and a solid debut for Pull Together Productions’ first Off-Broadway show. Katharine McLeod is the effervescent one, starring as Cass (the role created by Sarah Jessica Parker when the play premiered at Manhattan Theatre Club in 2001), who heads to Niagara Falls on a journey of self discovery following a betrayal by her husband, Kip (Aaron Blakely). As she checks off a list of more than 200 things she always wanted to do before saying “I do” to Kip, she meets Lois, an alcoholic bent on getting revenge on the husband who abandoned her by throwing herself over the falls in a barrel -- a pickle barrel that she carries around with her -- which makes the revenge more sweet because her husband loves pickles. An unexpected friendship springs up between the two women. Along the way, Cass has an affair with Captain Mike (Michael Poignand), who pilots one of the Maid of the Mist tour boats on the river, and meets up with two inept, bumbling private detectives, Karla and Glen (Evangeline Johns and Tom Logon), who need some marriage counseling themselves. Turns out Kip hired them to find Cass, because he wants another chance. Blakely is a master of comedy as the phobia-driven husband afraid of clowns, among other things, who pines away for his missing wife while watching videos of their wedding and hearing “their song” on the radio. The whole crowd eventually ends up in Cass and Lois’ motel room. 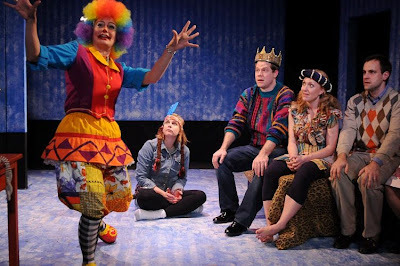 Enter Janie (Bryn Boice), Karla and Glen’s marriage therapist, who comes over in a clown costume (much to Kip’s horror) to conduct a session of the “The Newlywed Game” to help this bunch of looneys figure out what they really need and want. Boice also shines comedically as a helicopter pilot, a woman Cass and Lois meet at the falls and as waitresses in three different tourist-trap restaurants. Gillespie keeps the pace quick and uses fun gimmicks like toy boats and helicopters to lend to the zany mood of the play. As a song appropriate to the action plays in between scenes, cracker-jack stage crew members quickly change a platform, a railing and a few pieces of furniture into designer Emily Lippolis’ clever renditions of various settings (loved the triple-threat wooden hoop that serves as a dressing-table mirror, a ship’s wheel and a car steering wheel). Gillespie needs to rein in Benson, however, who expresses most of her emotions by shouting them. It’s catching, as other actors in the scenes begin shouting their lines too. In fact, the scene where everyone is shouting over the noise of the falls (nicely created by sound designer Andy Leviss) doesn’t seem all that different from some of the others. 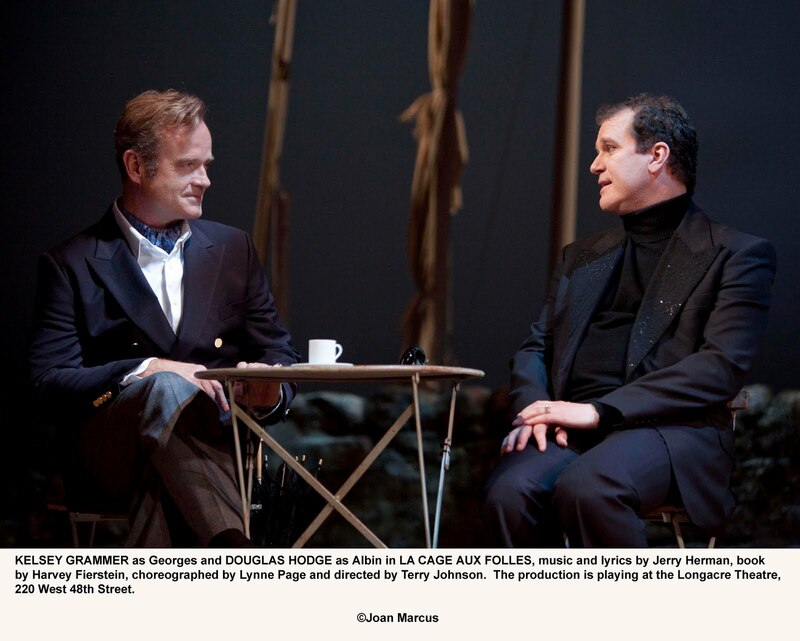 Lindsay-Abaire’s terrific dialogue doesn’t need amplification; his intertwining of events in the lives of these over-the-top characters is skilled playwriting with precision. When Benson did deliver a couple of lines in a softer tone, they were very funny and far more effective. Wonder of the World runs through June 26 at the Shell Theater on the fourth floor of the Times Square Arts Center, 300 West 43rd St., NYC. Performances are Thursday through Saturday at 8 pm with a Wednesday, June 16 performance at 8 and a Sunday evening performance on June 20 at 7. Tickets can be purchased through SmartTix at http://www.smarttix.com/ or by calling 212-868-4444. 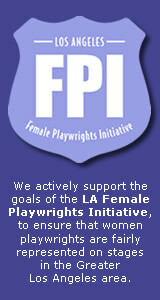 For more information about the company, visit http://www.pulltogetherproductions.org/. • Sexual dialogue. I don’t want to give anything away, but Kip’s betrayal of Cass involves a rather nasty sexual practice. 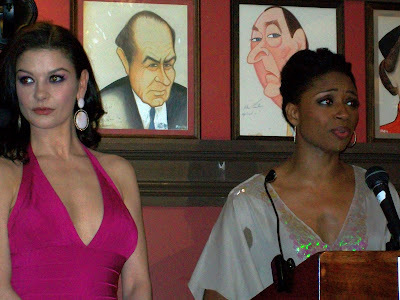 The musical Memphis and the play Red dominated the 2010 Tony Awards June 13. A complete list of all the nominees and winners follows. Winners are indicated by bold face and a **. For a review of the show, click on it. 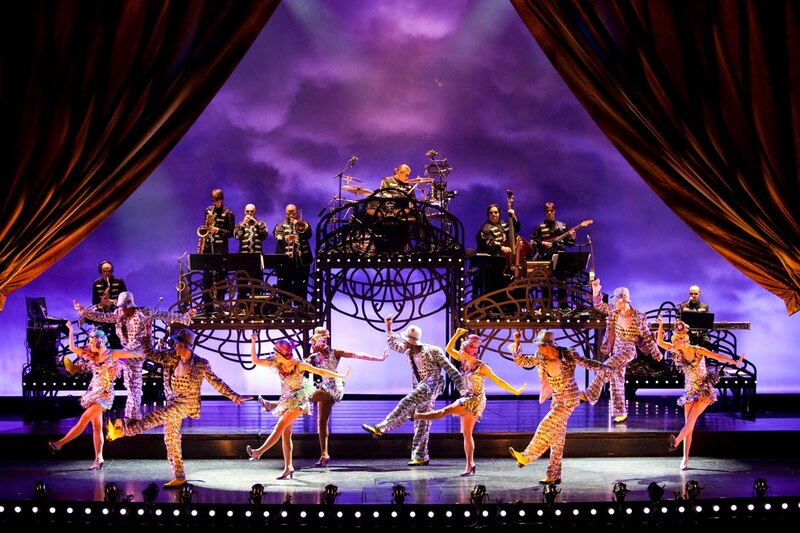 If you’re a fan of the old TV show “Taxi,” you’ll probably get a kick out of a couple of the characters in Cirque du Soleil’s newest show, Banana Shpeel, playing Off-Broadway at the newly refurbished Beacon Theater. If you’re a fan of the Canada-based presentations that are usually a dream-like blend of music, costumes and circus feats, this journey off the beaten path into the world of Vaudeville (well, Vaudeville-like would be a better description) might not be what you’re expecting. The acts aren’t really vaudeville numbers, but traditional cirque offerings with some non-traditional tap dancing numbers featuring Joseph and Josette C. Wiggans with choreography by Jared Grimes. There also are contortionists (Tsybenova Ayagma, Tsydendambaeva Imin and Zhambalova Lilia), a foot juggler (Vanessa Alvarez) and a hand-balancing act (Dimitri Bulkin) that’s truly artistic and gravity-defying. You also can expect the traditional interaction with audience members. What’s rather unexpected and unfortunate is the frequent use of sexually charged dialogue, language and the use of God’s name in vain, all of which give pause about the appropriateness of the show for little ones (say age 10 and under). It’s all unnecessary in what otherwise would be a fun and entertaining program from Director of Creation Serge Roy and writer David Shiner, who also directs. (between 74th & 75th streets). For tickets call 212-465-6500. Additional note: The overzealous staff at the Beacon will require a photo ID for you to pick up your tickets at the box office and will search your bags and require you to throw out any food or drink you might have with you when entering the theater. TADA! Youth Theater concludes its 25th anniversary celebration with the New York premiere of The Magic Pot: Three Tales from China, book, music, and lyrics by Dane Stauffer, co-commissioned with the SteppingStone Theatre in St. Paul, MN. The show runs July 9- Aug. 4. 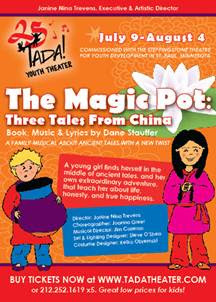 The Magic Pot: Three Tales from China is an original musical for kids, performed by kids, about a young girl who finds herself in the middle of ancient tales, and her own extraordinary adventure, that teach her about life, honesty, and true happiness. Premium tickets are $25 for adults and $15 for children; regular tickets are $20 for adults, $8 for children and can be purchased at www.tadatheater.com or by calling (212) 252-1619 x5. Group sales are also available for parties of 20 or more starting at $6 each for kids and can be purchased by phone. Performances are Tuesdays – Fridays at noon and 2 pm and Saturdays at 2 and 4 pm. TADA! Theater is located at 15 West 28th St., NYC. 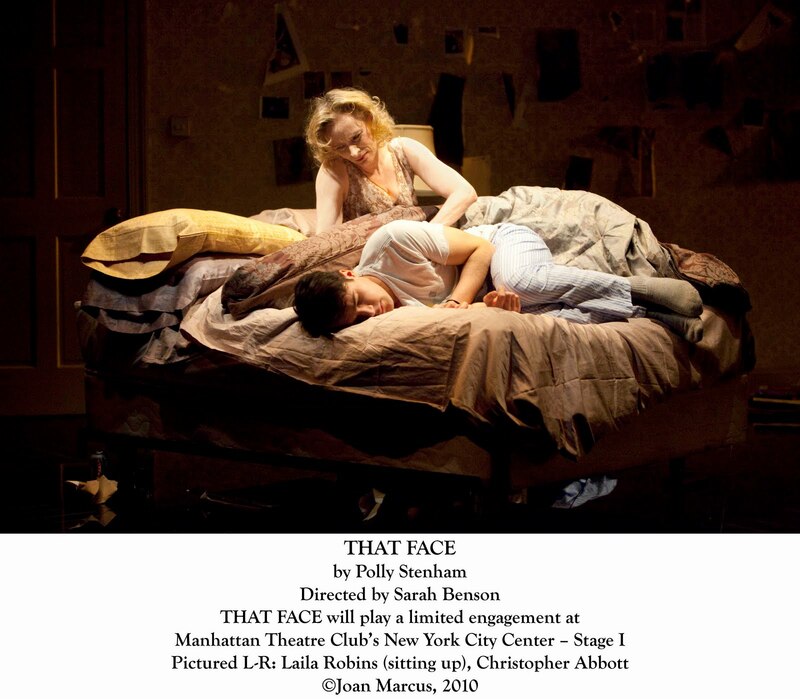 The most disturbing thing about Manhattan Theatre Club’s production of That Face playing Off-Broadway at New York City Center isn’t actually anything that happens in the play, though there’s more than plenty of worrying things to go around in this dysfunction fest. What’s truly disturbing is that such a trip into abnormal family interaction should come from the tender mind of 19-year-old Polly Stenham (winner of britain's 2008 Critics Circle Award for Most Promising New Playwright.) Then again, no mind, young or old, should have to delve into the psyches of families such as this. First we have the mother from hell -- and no dysfunction fest would be complete without one-- whose children for some reason constantly have to remember to call her Martha instead of Mommy when she’s sober enough to realize they are talking to her. Martha, I mean Mommy -- or do I mean Martha/Mommy (a really good Laila Robins who gives a full emotional arc) -- is disturbingly attached to/attracted to her son, Henry (Christopher Abbott), whose face she loves to gaze on and which is the only thing in the world that means anything to her. Henry quits school to stay with her in their shabby, but once-noble flat (David Zinn, scenic and costume design) decorated with pinned up drawings he's learning from Martha' art lessons. He sleeps in her bed, dresses in her nighties (which comes in handy after she cuts up all his clothes in a jealous rage) and even drinks with her in the hopes that giving in to her bizarre demands might just coax some “normal” behavior out of her. Meanwhile, daughter, Mia (Cristin Milioti), may be expelled from school for drugging, torturing and beating underclassman Alice (Maite Alina) in a hazing incident led by whacko friend Izzy (Betty Gilpin) who enjoys Mia’s discomfort when she shares her sexual escapades with Henry. It’s up to the family’s dad, Hugh (Victor Slezak), to leave his new wife and child in Asia and fly back to London to try to fix the problems of family number one. “Is that it? Is that all? Henry spends a lot of time talking about who called on the phone, that his mother answered the phone, that his mother hung up the phone, that he should have answered the phone, wondering why someone didn’t call him on his cell phone, wondering why his father didn’t call on the phone. In the end, Mia also questions her father about whether he called her mother on the phone. We never hear an actual phone conversation, or any other dialogue that might take the plot somewhere, however, so the characters don’t grow much. By the end of the play all we’re sure about is that “normal” Henry is just a sick as Mommy -- I mean Martha -- I mean Martha/Mommy -- and there‘s a pretty disturbing scene involving urination to prove it. The performances, directed by Sarah Benson, actually are very well executed all around. They are emotional characters and the actors reach down deep to portray them -- we just don’t care much about them or understand why they are so whacked. Denzel Washington, best Actor in a play for Fences. Catherine Zeta-Jones (A Little Night Music) and Montego Glover (Memphis) tied for best actress in a musical. OCC President Simon Saltzman (right) presents a scroll to special honoree Louis A. Rachow, retiring after 15 years as treasurer of the Outer Critics Circle.